During the 1960's the second VS-44A, N41881, c/n 4403, flew between Catalina Island and the mainland. At the time there were Grumman Goose aircraft flying the same route. The VS-44A was larger and had 4 engines, hence, the aircraft was fondly called the Mother Goose. 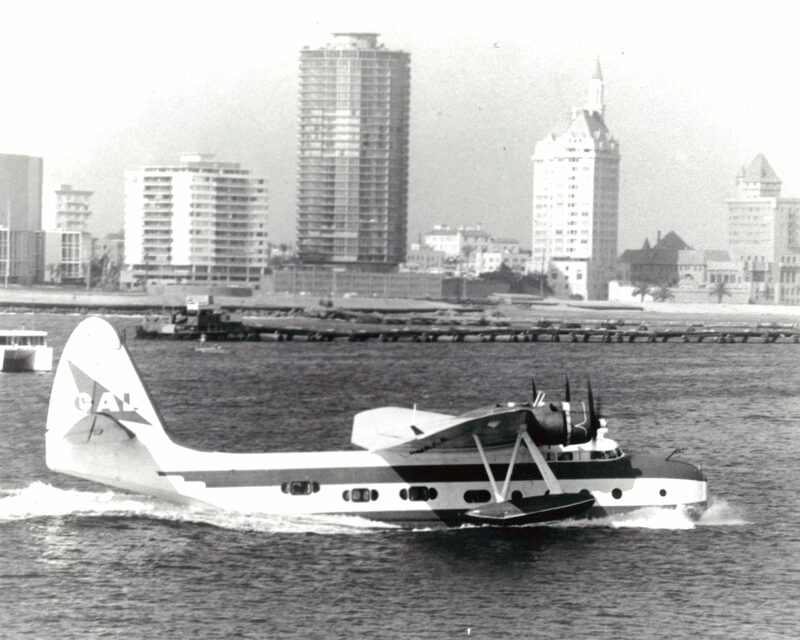 This photo shows this beautiful flying boat taxing near Pacific Landing, Long Beach, California, circa 1967. J2 / J-2 CF-BKE Likely status: extant / operational, N12YZ. J3 / J-3 N2941 Extant 1980; N41DF. J4 / J-4 N2940 Likely status: extant, N604SS. J7 - J-7 N2944 Crashed March 5, 1974, Canada. J8 / J-8 N2945 Likely status: extant / operational, N2945. J10 / J-10 N2947 Likely status: extant, N610SS. J12 / J-12 N2949 Likely status: extant, N2949. J15 / J-15 N2956 Crashed on takeoff, Britain, October 28, 1949. J16 / J-16 CF-FOD Crashed January 10, 1954 / 1958, Louisana. J17 / J-17 N2957 DBR ( damaged beyond repair ) May 18, 1970, Indonesia. J19 / J-19 N2959 Likely status: extant, N95DF. J20 / J-20 CF-FLC Destroyed, Canada, 1963. J21 / J-21 N2961 Likely status: extant / operational, N775WA. J25 / J-25 N2968 Likely status: extant, N2968. J28 / J-28 N2970 Likely status: extant, N628SS. J29 / J-29 N2971 Crashed / lost - mid to late 1950's / 1960's ? J31 / J-31 N2992 Likely status: extant / operational, N1888T. J33 / J-33 CF-GEU Crashed January 15, 1955, Canada. J37 / J-37 PK-AKU Scrapped, Singapore, March, 1959. J38 / J-38 N2973 Likely status: extant, N638SS. J39 / J-39 N2975 Crashed, August 3, 1955, Canada. J40 / J-40 N2996 Crashed, February 18, 1964, Japan. J41 / J-41 G-ALLJ Destroyed, January 27, 1951, Djakarta. J46 / J-46 N74044 Crashed September 30, 1950, Ohio. J47 / J-47 F7 Likely status: extant in a junk yard in Egypt. J52 / J-52 N2982 Lost, 1975, Atlantic Ocean, near Gabon, TR-LSW. J53 / J-53 N2983 Likely status: extant, N653SS. J54 / J-54 N2984 Likely status: extant / operational, N54GZ. J55 / J-55 N2986 Likely status: extant, N655SS. J56 / J-56 N5118 Likely status: extant / operational, N7356. J57 / J-57 N2990 Likely status: extant / operational, N188AC. J58 / J-58 N2989 Crashed on takeoff, May 3, 1967, South Dakota. J59 / J-59 N2993 Destroyed, Canada, December 8, 1954. 900X NC-42V likely status: non-extant. 902 NC-888W likely status: non-extant. 903 NC-802Y likely status: non-extant. 904 NC-803W on static display, New England Air Museum, Connecticut. 906 NC-896W likely status: non-extant. 907 NC-805W likely status: non-extant. 910 NC-808W likely status: non-extant. 911 NC-809W likely status: still at the bottom of Two Lakes, Alaska ? 912 NC-50V likely status: extant / operational, NC-50V. 913 NC-51V likely status: non-extant. 916 NC-54V likely status: non-extant. 918 NC-14326 crashed August 1936, New York. 920 NC-58V likely status: hull / fuselage extant. NOTE: A (+) symbol after the aircraft note indicates that there is at least one picture of this aircraft on the website. A ( T ) symbol after a Grumman Mallard indicates a known conversion to a turbine Mallard.